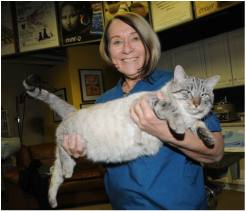 (holding flying Frankie the clinic cat) has been our veterinarian since we began in 1992. She is a graduate of Washington State University's School of Veterinary Medicine. Dr. Kennaway advocates a holistic ("whole patient") approach to veterinary medicine. While much of her practice involves western veterinary techniques, Dr. Kennaway often supplements these with alternative treatment modalities, as appropriate for the patient & client. These include homeopathy, herbal medicine, nutrition & acupuncture. She is a trained practitioner of Traditional Chinese Herbal Medicine & Veterinary Acupuncture. is a woman of many talents. We are fortunate that she donates some of her precious time to care for the animals in the shelter and assist in surgery. Spring is not afraid to "get dirty" and is an expert at pulling meds and anticipating each pet's medical needs. has devoted her retirement years to helping abandoned, abused and lost animals find loving homes. Tessa brings her excellent social media and writing skills to bear for the clinic and is enjoying wrapping her brain around clinic duties. When you're checking out our Facebook page you're looking at Tessa's amazing handiwork. as a child, voiced the roles of Lucy, Violet & Patty in the Charlie Brown specials. Little did she know then just how prophetic Lucy's line "Blech. I've been kissed by a dog!" would turn out to be – it happens all the time now! Sally is also the owner of Soiled Doves Studio in Jerome, and is a mixed-media sculptor & master framer. 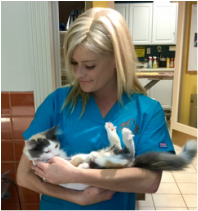 But on Thursdays, she's a veterinary technician at the clinic and is the "go-to" person for anyone who needs assistance with their pet. Oh...and she's also a lot of fun & gives great parties. has more energy than most and the kindest heart of all. 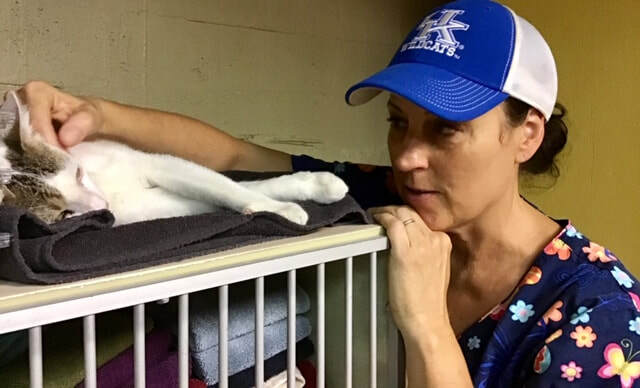 Teri shares many of the responsibilities that Sally has and, when she isn't busy with her regular job, can be found caring for all the animals at the clinic at all hours. She and her husband, Jeff, care for 5 (maybe 6) cats of their own at their house at the top of town. is both a talented tattoo artist and just about the most upbeat person you'd want to know. He volunteers for everything and is quite handy in the operating room. Johnny not only is one of the many members of our incredible Jerome volunteer fire department but he can also be seen on the front lines fighting forest fires across the country! is one of our original technicians. She has been ably assisting Dr. Kennaway for longer than we can recall. No animal comes out of surgery without being cuddled & kissed by Marge. (It really helps!) She is also a master chef, owned several restaurants, & has co-authored 2 cookbooks: The Bakery Lane Soup Bowl Cook Book & Soup Bowl West and treats the staff to yummy lunches! is a highly skilled kaleidoscope and glass artist who resides on the edge of town. Like everyone at JHS Lori is willing and able to assist with anything at the clinic at a moment's notice. always has time to play with the animals at the clinic and everywhere else in town while troubleshooting and fixing anything that needs attention. If not toting a tool belt then he's wearing a backpack and can be most likely found exploring remote locations in the desert Southwest.